Only a few weeks ago the Kitchen Stories office was in the middle of Berlin’s Kreuzberg, a neighborhood with near infinite possibilities for a quick lunch. Now that we’ve relocated, we have a lot more space to work, but also drastically fewer options when it comes to grabbing a bite midday. But for anyone who might think we all sit tight at our desks, longing for the evening with a snarling stomach, is dead wrong—because when lunch time comes along, the team kitchen suddenly seems to fill up with a lot more people than we could have ever hoped to see in our previous office. While meal prep has been a real trend for years, it somewhat unexpectedly just become a big topic for us—with who brings what, when and how it was prepared, plus how to transport it becoming full-blown conversations around the lunch table. We’ve discovered that meal prep not only saves money but can also save time, if you plan cleverly. So, how do you start with meal prep, what mistakes can be avoided, and what form of meal prep is right for you? In addition to many inspirations, motivations, and tips, we’ll also show you numerous recipes that you can prepare in order to take your office lunch to a whole new level. Since the list of tips, tricks, and recipes is infinitely long, we simply can't accommodate all of them in this article. Do you have more ideas or want to share your experiences about meal prep with the community? Let us know in the comments! It probably goes without saying, but meal prep is the short form of meal preparation, which is the preparation of any meal—breakfast, lunch, or dinner. Whether you’ve done it consciously or not, meal prep is a skill that everyone should know. You don't want to spend a lot of time cooking after work but still want to eat healthy at home? Don’t fancy the idea of supermarket salads or takeaway dishes for lunch? Do you eat gluten-free or vegan and can't find suitable food in the office cafeteria? The solution to all these problems is meal prep, or preparing dishes ahead of time that can hang out in the fridge or freezer and be warmed up and served in minutes at the office. However, there are several approaches for meal prep. If you’ve been intimidated by all the Instagram profiles out there with photos of fridges and freezers full to the brim or beautifully packed lunches that seem out of the realm of your possibility—don't worry, there are lots of suitable solutions for real life. Before you find the right type of meal prep that works for you, you should ask yourself these questions: Do you prefer to prepare dishes completely or just prepare individual components that you can put together differently over several days? Which days of your week are best suited for meal prep? Do you like to eat the same dish for several days in a row or do you crave variety at lunch? Do you want to prep breakfast, lunch, and/or dinner ahead? Now that you've answered these questions for yourself, it's time to go through the next steps and gradually start to integrate them into your everyday meal prepping life. In my personal experience, planning is the most important thing about meal prep. Start by writing down your meal plan for the week ahead. Depending on how prepared you want to be, you can write everything from breakfast to lunch, dinner to snacks, or choose to focus on the individual meals that matter most for you. But then there’s the question of how to fill the plan. A few questions to make it easier to choose the dishes you’ll cook: Which fruits and vegetables are currently in season? What groceries in my kitchen urgently need to be used up and what do I just really want to eat? Base your meal planning on these answers and gradually fill up the week. Also take note of what might be leftover for use later in the week. For example, if you make curry with rice on Monday and a fresh salad on Tuesday, maybe fried rice would fit perfectly for Wednesday—as you can use both the leftover rice from Monday and leftover salad veg from Tuesday. Those who just want to make one big batch dish and portion it out for the whole week have even less work filling in their plan! After the plan, comes the shopping list. Most meal prep books and guides suggest Saturday as a shopping day and Sunday for cooking or prepping. This works for many people, but if you have to work on weekends or have an odd schedule, you can always just shift these days to make them fit for you. However, in order to ensure the freshness of your prepped meals, it’s advisable to combine shopping and precooking in one or two days and never precook for more than 3 – 4 days at a time. As long as the dishes you’re making keep fresh in the refrigerator, you’ll be fine. Those who want to cover more days should either have a second meal prep day in their week or cover the remaining meals with frozen dishes. The biggest mistake you can make is wanting to do too much at once. Instead of diving right in and prepping all your meals for a week, I would recommend starting with just one—lunch, for example. Even when choosing recipes, you can quickly start to overload yourself—so take the time to be honest with yourself about what is and isn’t possible. Meal prep is a great way to test recipes and become a better cook, but it's also a great time to fall back on your tried and tested favorites. Meal prep is not meant to drive you mad—it’s supposed to be fun—so instead of starting off with homemade ravioli or coq au vin , start with a one-pot recipe, soup, or a simple base (like beans or tofu) that you can quickly change with different toppings, fresh components, and sauces. From there, you can gradually expand and improve your meal prep repertoire. For some people, stocking up on practical lunchboxes is a highly motivating moment, while others are overwhelmed by so many choices. 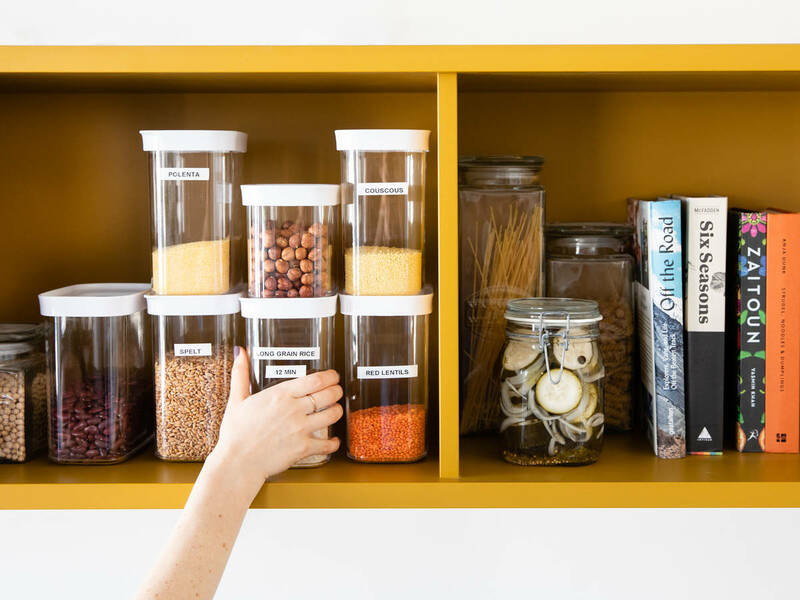 However, there’s a high probability that you already have the right equipment in your kitchen—I mean we all have some glass jars, airtight containers, or tupperware standing around, right? In the refrigerator, I’m sure there’s a jar of pickles or other small glass containers of things like curry paste or pesto—once you have empty glass containers, you should not throw away the glasses, but instead wash them out and use them for your meal prep! They can store dressings, sauces, nuts, chopped vegetables—in short, they are extremely useful. I just had to ask the Kitchen Stories team about which lunch boxes are high on their list. In addition the containers already mentioned, there are great thermal containers that will keep soups hot and not leak, stackable stainless steel boxes that work and look great, and salad glasses with separate dressing containers—excellent! One of the simplest and fastest meal prep secrets is simply big batch cooking, or making a dish or some components in an extra-large quantity to then cool and portion out for many meals. Probably the most common choice for this would be various things like rice, chicken, or vegetables. On your meal prep day, simply cook a larger portion of rice, slide a sheet of seasonal vegetables into the oven, or brown several chicken breasts. Then you distribute the food to three to four lunchboxes and are done with the meal prep in just under an hour—easy, right? To bring a bit of variety to this lunch, you could add different herbs or nuts, split the oven vegetables separately, or season the chicken breasts with different spices. You can also prepare salads and bowls in larger quantities, put them in containers, and transport the dressing and toppings separately in a smaller glass jar or container. Our superfood salad and buddha bowlsare great as a healthy office lunch, but are best eaten within 2 days of prepping—however the avocado of course should be sliced only just before eating. You should pack the sauces separately and cut the avocado just before eating. A more creative but also more elaborate method of meal prep is to prepare a bunch of different ingredients, which can then be mixed and matched over several days. This is actually my preferred method of meal prep because it also allows me to use the leftovers of my dinner, which take no “extra” prep. The disadvantage? With this form of meal prep, no complete dishes are prepared, which also means that you may have to cook again in order to complete your dish. For the planning, I recommend choosing different dishes that have overlapping ingredients. You can also start with an ingredient that you are particularly craving and go from there. Take rice noodles for example. First prepare a Thai rice noodle soup. Make some extra noodles and put some in a glass for a takeaway noodle soup in a jar and prep the rest into a rice noodle salad. 3 different dishes, from cold to hot, whose ingredients you can prep with each other but still get a very different taste. With just those ingredients, you will be rewarded with many dishes that you can throw together. For example, a quinoa salad with tahini dressing, a vegetable and bean sandwich with pesto, a kimchi vegetable stew, or a fresh lettuce wrap with beans, quinoa, and tahini dressing. Still have some leftover vegetables? Mash them up and make a soup! Yes, creativity and a bit more time and commitment are required with this type of meal prepping, but your lunch will be anything but boring. The freezer plays an extremely important role in meal prep in so many ways. On the one hand, you can turn it into another pantry from which you can serve yourself at any time. For example, in my freezer you can already find sliced ​​bread, frozen vegetables such as spinach and edamame, dough sheets for dumplings, and some ice cube trays filled with curry paste, cookie dough, and more. On the other hand, you can freeze already prepared dishes, which gives them a much longer shelf life than just storing them in the fridge. To start, I would recommend cooking one or two dishes and freezing them in portions. Then you know they are there and they can serve as your safety net for all those days or weeks when you didn’t have time for meal prep or have a spontaneous craving. Recipes that are particularly well suited for freezing are soups and stews, casseroles, enchiladas, burritos, and dumplings. 1) Always let the food cool down first, even before you put it in the fridge! 3) Do not freeze twice: Once thawed, use it, and do not refreeze it. To avoid waste, it makes sense to freeze dishes in small portions.